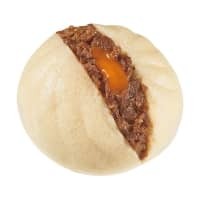 Nothing makes a cold winter day feel better than a piping-hot steam bun from the convenience store. The recent crop in this category have really delivered — Lawson’s fried chicken variety is a highlight you should definitely try if you come across it — and the past week saw two more intriguing takes hit the snack rack. Lawson has teamed up with the anime “Fate/stay Night: Heaven’s Feel II. Lost Butterfly” for the “Oruta-man” bun. This snack (¥200 with tax) is based off one of the film’s characters, but you need zero knowledge of the film to enjoy the contents within. Each bun is filled with a dark sesame paste that delivers a nice sweet flavor ideal for a post-snack dessert. A more creative bun comes from FamilyMart. It has basically condensed sukiyaki down into a fluffy snack with its latest creation, which features beef coupled with soy sauce and something dubbed “egg yolk sauce.” This creation (¥238 with tax included) sounds a little more dicey, but tastes fine, offering a konbini-level take on sukiyaki. A pleasant novelty, and a good way to warm up on a frosty day.